Several of the bundles have sold out. The All in the Family Bundle and Curly Label Punch Bundle are gone. You have until the first to place your order for these incredible savings. Just click on the shopping cart to get to the SU website to take a look and purchase. The picture posted is Onesies that I have stamped with one of the sets Wild About You that is bundled with Bold Bright Card Stock and Bold Bright Classic Stampin Spots at a 20% savings. 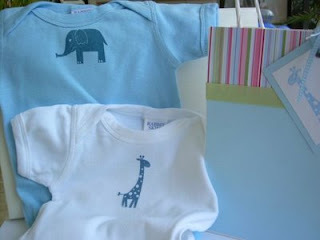 These onesies make wonderful baby gifts along with a great decorated bag and tag. Just an idea for those soon to be grandma's that want something a little different and something you hand created for the newest member of the family.